Can you give an example of how CRS carries out that mission of serving the poor with excellence? One initiative is providing access to capital for people who cannot afford loans. If you're a farmer, you need to buy seed before you have any harvest. Or if you want to have an egg business, you've got to have money to buy chickens first. One very popular source is what is called microfinance, offering microloans of $25 or $50 that allow people to start things. That's a wonderful creation. Muhammad Yunus got a Nobel Prize for that. But in a lot of places, even such microloans create too much risk for farmers. And a lot of women don't have access even to those microloans. A while back CRS realized that microloans themselves are more risky than what our beneficiaries could handle. So we offer an alternative, called Savings and Internal Lending Communities (SILC). The whole idea is no matter how poor you are, if we gather people, like 20 or 30 people together, and every week or month consistently they give whatever they can—even if it is 25 cents or 50 cents—then together they would be able to have a pool of money and they could take turns accessing it. That's why it's called internal savings and internal lending. It's internal to this group. You don't have to deal with that massive interest rate, you just pool your money and the groups set the rules for lending themselves. Sometimes you can choose to lend to someone outside of the circle. There is actually an encouragement to lend the money out, because that's how you make investments. By charging a modest interest, you could make a profit. Is this concept a new idea? We started this about seven years ago, and we now have 1 million participants. The total amount of money that they were able to save and lend out is U.S. $7 million. These are very poor people. That's why we're really proud of this. The concept is not new, but the implementation requires innovation. I saw this working with my mother and aunt in Hong Kong. They would get together and talk about whether they had collected money from so and so, and who wants to bid for the money that month. I saw what it allowed these women to do. Sometimes they could have enough for a down payment on a house. Hong Kong had a booming market, so once you put in a down payment, then you could collect rent. Sometimes people bought stocks. Sometimes people used the money to send their children overseas for school. Actually, this is a folk model which exists in certain cultures. What CRS did was that we took that concept and scaled it up and provided the training. How do you organize 30 people if they don't know arithmetic? What type of training do you give them? How do you teach them to manage money? How do you develop social norms and enforce these? It gives them a sense of empowerment when they actually have capital, and also acts as an incentive to learn numbers. Of course, because you can now lend other people money, you also become more aware of where the opportunities are. Is this model primarily aimed at helping women? About 80 to 90 percent of those in the lending communities are women. In one community we visited, I believe in Cambodia, the women were all from the Legion of Mary. It is really a way of empowering women. They have no access to microloans. We found in our research that most of these people have no access to the banking infrastructure, partially due to distance and partially because of cultural reasons. How successful have the Savings and Internal Lending Communities been? Some of the people have bakeries. There was a bakery where the members thought they had enough materials to operate for three months. They sold out everything in one week. It was that popular. They sold cakes to the local police department, so the idea that police love donuts is a global thing. The leader of the group lost a child to starvation before this enterprise. I met a group of women who made curtains for the most basic dwellings, and business has flourished. 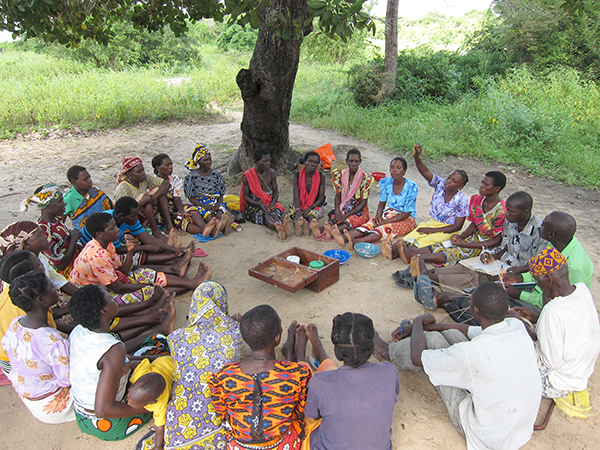 These groups of 20 or 30 people now become very natural units for implementing other programs: health, nutrition, some type of social action programs. They organize them. If there's an issue with abuse in the local community, they become a natural group to work with. There are a lot of benefits associated with that. For these benefits, we integrate SILC into many of our programs. We realized that this model is so popular we need to do it on a larger scale. But we would never raise enough money or hire enough people to scale up to the level that it has potential for, so we created what we call a "private service provider" or PSP model. The PSP model is where certain members of the SILC groups get certified by us, and then they can go and start more groups and be paid to do it. It's not quite a career, it is more of a side job. But once you're certified, you go work with a lot of groups and you can also take on apprentices. The apprentices could also get certified. We did the research and found that groups will actually pay someone to work with them, either to help new groups get started or to help existing groups become more advanced. We're actually creating new opportunities for people. It's passing on to others so that the work can grow beyond CRS. It's a very exciting development for us. Innovation is critical and ongoing. The nature of problems changes, so does the technology and know-how. And we must therefore learn, invent, and change so that we can bring our best to the people we serve.